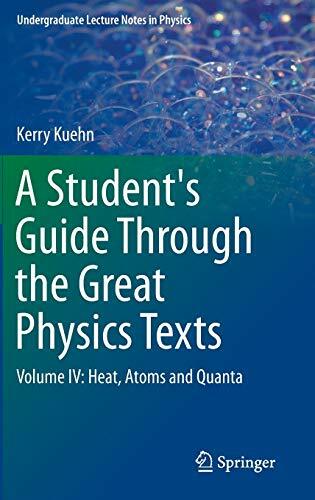 [PDF] A Student's Guide Through the Great Physics Texts: Volume IV: Heat, Atoms and Quanta (Undergraduate Lecture Notes in Physics) | Free eBooks Download - EBOOKEE! Description: This book provides a chronological introduction to modern atomic theory, which represented an attempt to reconcile the ancient doctrine of atomism with careful experiments?performed during the 19th century?on the flow of heat through substances and across empty space. Included herein are selections from classic texts such as Carnotâ€™s Reflection on the Motive Power of Fire, Clausiusâ€™ Mechanical Theory of Heat, Rutherfordâ€™s Nuclear Constitution of Atoms, Planckâ€™s Atomic Theory of Matter, and Heisenbergâ€™s Copenhagen Interpretation of Quantum Theory. Each chapter begins with a short introduction followed by a reading selection. Carefully crafted study questions draw out key points in the text and focus the readerâ€™s attention on the authorâ€™s methods, analysis and conclusions. Numerical and laboratory exercises at the end of each chapter test the readerâ€™s ability to understand and apply key concepts from the text. Heat, Radiation and Quanta is the last of four volumes in A Studentâ€™s Guide through the Great Physics Texts. The book comes from a four-semester undergraduate physics curriculum designed to encourage a critical and circumspect approach to natural science while at the same time preparing students for advanced coursework in physics. This book is particularly suitable as a college-level textbook for students of the natural sciences, history or philosophy. It might also serve as a textbook for advanced high-school or home-schooled students, or as a thematically-organized source-book for scholars and motivated lay-readers. In studying the classic scientific texts included herein, the reader will be drawn toward a lifetime of contemplation. No comments for "[PDF] A Student's Guide Through the Great Physics Texts: Volume IV: Heat, Atoms and Quanta (Undergraduate Lecture Notes in Physics)".